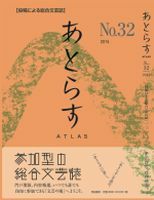 The Japanese literary magazine Atlas in its January 2018 issue No. 37 published Hiromi Mizoguchi's translation of Hans Brinckmann's essay about his meeting in Washington D.C. in 1985 with Republican Senator Jake Garn, who had just returned from space as the first U.S. member of Congress to fly on a Space Shuttle. Also in January, No. 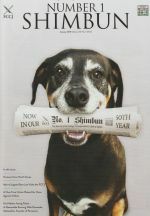 1 Shimbun, the monthly magazine of the Foreign Correspondents Club of Japan in Tokyo, published Hans Brinckmann's essay entitled "His Hidden Acting Talent: A Memorable Evening with Konosuke Matsushita, the founder of Panasonic, in 1967"
Hiromi Mizoguchi's translation of this essay appeared earlier in Atlas No. 31 in January 2015. On February 28, from 18:30, Hans Brinckmann will be giving a presentation at the Royal Netherlands Embassy in Tokyo entitled "The Challenges of Dutch Life and Work in Post-War Japan." 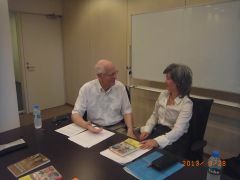 Illustrated with Power Point, he will talk about his many unforgettable experiences as a Dutch national living in Japan from the 1950's to the early 70's and the role his bank played in Japan's post-war recovery. The event is free and open to the public, but prior registration is required by February 23. See below for details and how to apply. 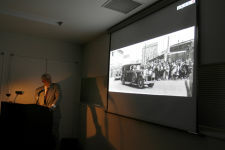 On February 28, Brinckmann gave a presentation at the Netherlands Embassy in Tokyo on The Challenges of Dutch Life and Work in Post-War Japan, illustrated with his own period photos, projected by Power Point. 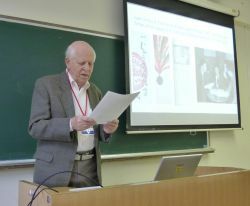 The talk covered the social and business situation in Kobe, Osaka and Tokyo between Brinckmann's arrival in 1950 as a junior staff employee of a Dutch bank and his first home leave in 1956, and was based on his experiences and observations. 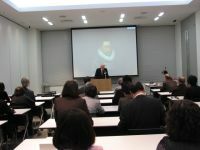 The presentation, attended by a mixed Japanese/international audience of about 60, was very well received. 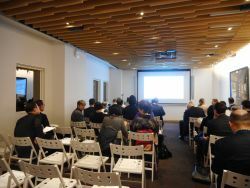 During the hour-long "networking" that followed the talk, many asked for "more:" what happened after 1956, including Brinckmann's mi-ai marriage to a Japanese literature graduate and the run-up to the 1964 Tokyo Olympics? Well, the embassy agreed to host a second presentation, see below. 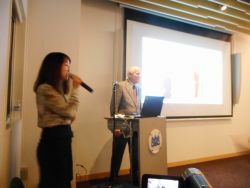 Here are some photos of the event, taken by Habri's Hiromi Mizoguchi, who had made the arrangements for the presentation with the embassy's Policy Officer Ms. Kim Dang, shown below right. 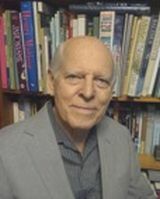 On Tuesday, June 5th, 2018, from 18:15, Hans Brinckmann will give a presentation at the Royal Netherlands Embassy in Tokyo entitled "Life, Work and Society in Japan between 1956 and the early1970s," based on his own experiences. Illustrated with Power Point photos, the talk will be held in response to popular demand as a follow-up of his presentation of February 28, also at the Embassy. The event is free and open to the public, but prior registration is required by June 1st. 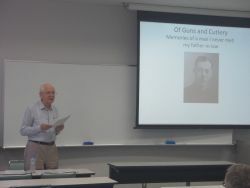 On June 5, Brinckmann gave a presentation in the Dejima Lounge of the Netherlands Embassy in Tokyo on "Life, Work and Society in Japan between 1956 and the mid-1970s". 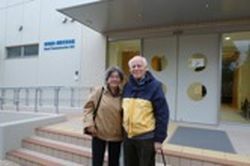 It was a follow-up on a similar presentation at the Embassy on February 28, 2018, which covered the period from 1950 â€“ when Hans first arrived in Japan â€“ and 1956, his first home leave in six years. 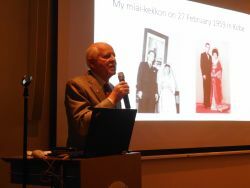 Apart from details about social and economic conditions in Japan during that period, the lecture also contained some facts about Hans' personal life, such as his miai kekkon (marriage through introduction) in 1959. 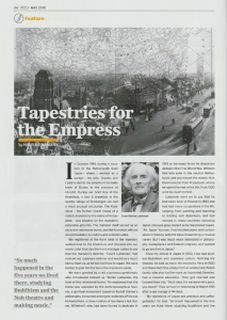 In the May issue of their "Number I Shimbun" magazine, the Foreign Correspondents Club of Japan published Brinckmann's essay, "Tapestries for the Empress" about a Polish Count who spent five years in Japan weaving tapestries to make a living and survived the 1923 Great Kanto Earthquake. Based on Hans' meeting with the Count in 1961. Hiromi Mizoguchi's translation of this essay appeared earlier in Atlas No. 30 in 2014. 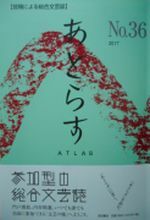 The Japanese literary magazine Atlas in its July 2018 issue No. 38 published Hiromi Mizoguchi's translation of Hans Brinckmann's essay about a memorable visit he received shortly before the 1964 Tokyo Olympics by Edmund ("Eddy") de Rothschild, a prominent London banker and horticulturist. On October 13th and 14th, your Habri team will be attending the annual Japan Writers Conference, which this time is held at Otaru University of Commerce in Otaru, Hokkaido. Hans will give a presentation with Power Point on the following subject: "What to avoid and what to focus on when writing a book about 'Japan'." Hiromi's presentation, also with Power Point, will be on "Deconstructing my translation of Brinckmann's The Tomb in the Kyoto Hills and Other Stories." On October 13 and 14, the Habri team joined the annual Japan Writers Conference, which this year was held in the coastal town of Otaru on the northern island of Hokkaido. 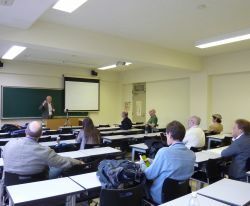 The conference took place at the Otaru University of Commerce, with Professor Shawn Clankie as the local host. As always, the poet John Gribble was the chief coordinator. 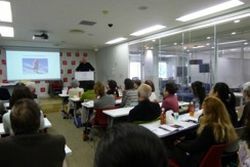 The conference was attended by about 120 mostly native English-speaking writers from all over Japan, thirty-six of whom gave talks or led workshops on writing. 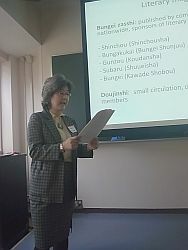 Your Habri team also made presentations with Power Point: Hiromi about "Deconstructing my translation of Brinckmann's award-winning 'The Tomb in the Kyoto Hills and other stories'," and Hans on "What to avoid and what to focus on when writing about 'Japan'." 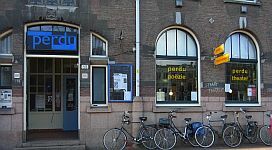 On December 22, your Habri team gave a lecture and book presentation in the event space of the PERDU Foundation in Amsterdam for a Dutch audience of twenty-ﬁve. 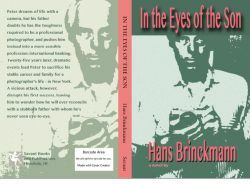 Hans Brinckmann, author of the novel In the Eyes of the Son and of The Tomb in the Kyoto Hills and other stories - both of which were awarded literary prizes at the 2015 and 2016 Paciﬁc Rim Book Festivals - read excerpts from both books with an emphasis on their autobiographical elements. 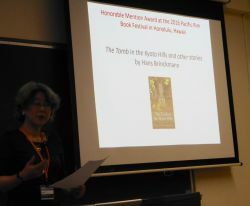 Hiromi Mizoguchi, who translates Hans's writings into Japanese, discussed aspects of translating his stories in The Tomb by focusing on how to render the realism of the characters, their dialogue, and other cultural details into Japanese. The presentation, starting at 8 p.m., was well received and a lively Q & A session followed, lasting until 10:30. On Tuesday March 14, from 10 to 12 a.m., Hans will give a talk in Tokyo about his childhood memories of the last year of the war in German-occupied Holland, and the 1944-45 "Hongerwinter" (the winter of starvation). He will focus on his family's struggle under increasingly dire circumstances, the threat of air raids, his solitary trips on a boy's bicycle to fetch food, and his father's dangerous position in the center of The Hague surrounded by the German military while hiding a fugitive in his attic. And a lot more! The event is organised by De Liefde Club, part of the Japan-Netherlands Association in Tokyo, and will take place at the Knowledge Society (5F Risona Kudan Building), 1-5-6 Kudan-Minami, Chiyoda-ku, Tokyo, a one-minute walk from Exit 4 of Kudanshita tube station. Although aimed at members of the JNS/De Liefde Club, there may be a limited number of seats available for non-members. If you are interested in attending, please send a brief email to info@habri.jp, and we will let you know close to the date whether a seat is available. 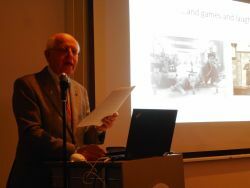 On March 14, Hans Brinckmann gave a lecture in Tokyo about his personal wartime experiences as a young boy in the final winter of WW2, 1944-45, known in Holland as the Hongerwinter - the Winter of Starvation.The talk, which was organised by the De Liefde Club, a division of the JapanNetherland Society in Tokyo, was a sold-out event, attended by 45 members. It was illustrated with Power-Point images of the war. The full text of Brinckmann's wartime memoir, self-published as a little book under the title The Monkey Dance, Chronicle of a 12-year old Dutch boy in the Winter of Starvation, 1944-1945. Both publications were available for purchase at the event, and can still be ordered by sending a message to the Habri mail address on the top page. Price: (1) Yen 1,000 plus postage (2) Yen 700 plus postage. 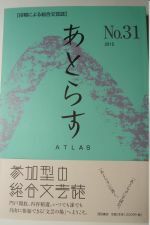 The Japanese literary magazine Atlas in July published Hiromi Mizoguchi's translation of Hans Brinckmann's essay about Dr. W.F. Hilton, a fascinating aeronautical and space scientist Hans met on a long flight from Sydney to London in 1995. This is the 8th time in a row that Atlas has published Brinckmann's writings. 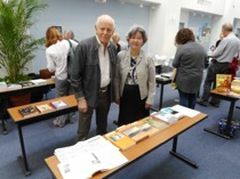 The 2017 Japan Writers' Conference was held on October 8 and 9 at Nihon University, Ekoda Campus, Tokyo. Your Habri team joined the conference. Hans Brinckmann talked on:"How Boyhood Memories of the Second World War Turned into Two Publications." At the Japan Writers Conference, I introduced both publications, read excerpts, and suggested ways to make personal experiences into literature by adding "remembered" dialogue, emphasising moments of tension and surprise, and injecting humor where appropriate. 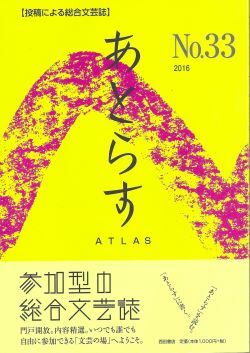 The literary magazine Atlas, published by Nishida Shoten in Kanda, Tokyo, has just released its first 2016 edition, which again features an essay by Hans Brinckmann, the fourth in a row in Hiromi Mizoguchi's translation. Its subject is Edwin O. Reischauer, a famous Harvard professor and U.S. ambassador to Japan from 1961 to 1966 whom Brinckmann met on a few memorable occasions. The essay, and some 25 others will eventually appear in their English original, most likely in book form. The Tomb in the Kyoto Hills and other stories is a collection of five semiautobiographical stories, all set in Japan. The title story of the book has its roots in an actual event I heard about in the mid-1970s: that of an American couple having moved to Kyoto to investigate the mysterious death of a boy-artist in the Kyoto hills. I followed in their footsteps to find the boy's elusive tomb, and the history behind it. Did I find what I was looking for? You may judge for yourself. Pets in Marriage is about a Japanese couple who love pets. He likes cats, she likes dogs. Their different predilections become symbolic for the rising tensions between them. The next story, Kyoto bus stop, is almost entirely based on a real experience, right down to the terrifying scene in the inn towards the end. Twice upon a plum tree, too, is in essence derived from an actual event, though the protagonist has been turned into a diplomat from the banker I used to be – among other changes. "I'm quite choosy with new titles... It was, therefore, a delight to come across such well-grounded and engaging narratives. The stories, all very strong on local detail, atmosphere and credible characterization, are structured to build anticipation and reader commitment, no easy task. The Undying Day is a collection of poems I wrote over the past half century. Their inspiration came from emotions as different as exhilaration and grief, and they were conceived in places as diverse as Kyoto, Sydney and Beverly Hills and many more. Hiromi Mizoguchi, the translator of previous books of mine, has rendered each poem in the collection into exquisite Japanese versions, presented side-by-side with the English originals. "Consistently, Brinckmann casts himself as mediator, a conducting material recharged by the stream of time. Where some poets, even great ones, resist the vision of anything finer than a futile individual existence, Brinckmann celebrates life's brimming energies, even as they discharge into more temperate currents with the advance of age." - from the review by Stephen Mansfield in The Japan Times of November 6, 2011. Issue no. 34 of the literary magazine Atlas features another of Hans Brinckmann's essays in Hiromi Mizoguchi's translation. 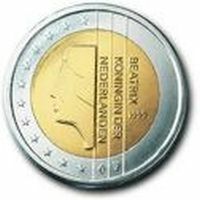 Its title is: The Lady on the Coin: my two memorable encounters with Beatrix of the Netherlands. The essay is a a report on my two meetings with the remarkable Beatrix, the first in Tokyo in 1963, when she was still Crown Princess, the second in The Hague in 1987, as Queen Beatrix. 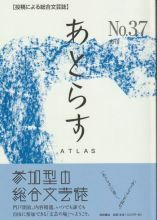 The essay is the fifth by Brinckmann appearing in Atlas, published by Nishida Shoten in Tokyo's Kanda district, famed for its many book shops. The English originals of the collection of essays will eventually appear in book form. Deep in the rolling hills of Kyushu, two hours' drive from Fukuoka, Yvonne Beelen, a many-sided artist from the Netherlands, spent three creative months as Artist in Residence at the unconventional Kyosei-no-sato Museum in Asakura, ending with an exhibition of some her quirky works created there. 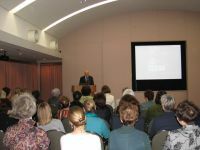 The highlight of the exhibition was an event on September 22, starting with an Artist's Talk in which Yvonne interacted with visitors, followed by a bilingual, English/Japanese, poetry reading by your Habri team from their award-winning poetry collection The Undying Day as a tribute to Yvonne. Here are some photographs taken at the venue. 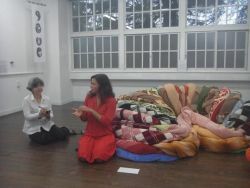 Top L: Hiromi Mizoguchi conferring with Yvonne Beelen en Kazunobu Yanagi, the museum's director, in the museum's main hall;R: Yvonne during her Talk Show.Bottom L: Yvonne's art work based on the woman's most private part, one of her themes; R: Hans and Hiromi reading poems from their collection The Undying Day. 5 min walk from Muntplein. 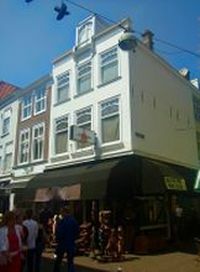 For an access map go to www.perdu.nl and click on "Bereikbaarheid." Free entry, but reservation required. Send brief email to: h2hpublishers@hotmail.com. There will be an open bar at the venue. Hans Brinckmann, author of the novel In the Eyes of the Son and of The Tomb in the Kyoto Hills and other stories - both of which were awarded literary prizes at the 2015 and 2016 Paciﬁc Rim Book Festivals - will be introducing and read excerpts from both books with an emphasis on their autobiographical elements. Hiromi Mizoguchi, who translates Hans's writings into Japanese, will discuss some aspects of translating his stories in The Tomb by focusing on how to render the authenticity of the characters, their dialogue, and other cultural details into Japanese. Hans Brinckmann, born in The Hague, joined a Dutch international bank in 1949. The following year he was sent to Singapore and five months later to Japan, where he lived for the next 24 years. After that he worked in London, Curacao, Amsterdam, New York, and Sydney before settling again in Japan in 2003. 1986 he was made an Officer in the Order of Orange-Nassau for cultural and business accomplishments in Japan and the USA. He left banking in 1988 to turn to writing. From 1991 to 2005 he was a contributing writer for the NRC and the Volkskrant. His publications to date include: The Magatama Doodle, a Japan memoir (2005); Noon Elusive, a collection of short stories (2006); Showa Japan, a history of post-war Japan (2008); The Tomb in the Kyoto Hills (2011), The Undying Day, an English/Japanese poetry collection jointly with Hiromi Mizoguchi (2011), and the novel In the Eyes of the Son (2014). Hiromi Mizoguchi is a translator, born in Tokyo. Mizoguchi obtained an MA from the Graduate School of Social and Cultural Studies, Kyushu University. 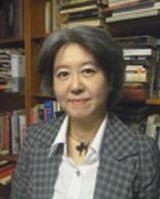 Her translation work includes the Japanese versions of Brinckmann's The Magatama Doodle, Showa Japan, The Undying Day, and a growing number of his essays and short stories for publication in Japanese literary magazines. 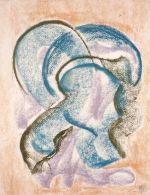 'Stichting Perdu' is a literary foundation interested in new developments within the field of prose and poetry. 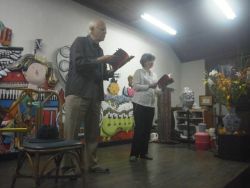 In the theatre adjacent to the poetry bookshop, Perdu organizes custommade literary programs striving for discussion. The 2016 Japan Writers' Conference was held on October 29 and 30 at Tokushima University, Tokushima City, Shikoku. Your Habri team joined the conference. Hans Brinckmann talked on: "Autobiographical fiction: what is it, and how to mould experience with invention?" Abstract of presentation: Using personal experiences when writing fiction is as old as literature, but if the narrative is too close to what actually happened, it may fail to disguise the truth - if that's what you want - or not carry enough oomph to please your readers. The trick is to "think fiction" when writing, and use the remembered facts or events as grist for the mill. I've done just that in The Tomb in the Kyoto Hills, an award-winning collection of stories all set in Japan. What also helped was using the third person in some of my autobiographical fiction, including my award-winning novel, In the Eyes of the Son. It provided the needed distance between myself and the story, and helped me concentrate on the narrative rather than worrying about being untrue to the personal experience. 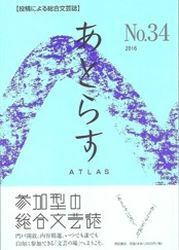 Hiromi Mizoguchi's translation of another essay by Hans Brinckmann was included in the Japanese-language literary magazine Atlas, Issue No. 31, published by Nishida Shoten in Kanda, Tokyo. The subject of the essay this time is the founder of Panasonic, and its title: "A memorable evening with Konosuke Matsushita: his hidden acting talent." It is based on a home party inn Tokyo Brinckmann attended in January 1967, where something extraordinary happened. The English original of the essay will be included in a collection essays Brinckmann plans to publish in the future. 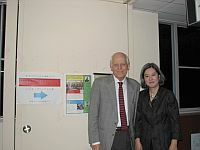 At the invitation of the FCCJ, Hans Brinckmann introduced his novel In the Eyes of the Son with a talk on its background and a reading of selected episodes. 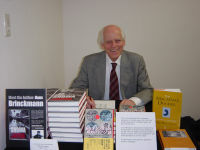 The event, which included Meet the Author cocktails, followed by dinner, was Brinckmann’s fourth Book Break at the Club since introducing his first book, The Magatama Doodle, in 2005. The event was called a "great success" by the organizers, and many books were sold. The Q & A was particularly animated, with questions like Why this title? – Why do you write in English? and What’s your next project? This month, the anthology – which includes three of Hans Brinckmann’s poems – was awarded an honorable mention at the 2015 Los Angeles Book Festival. The anthology also received an honorable mention at the 2014 London Book Festival, announced in January this year. 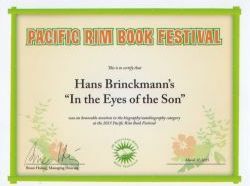 At the Pacific Rim Book Festival held on March 31, Hans Brinckmann’s novel In the Eyes of the Son received an Honorable Mention Award in the autobiographical fiction category. The awards ceremony took place at the Moana Surfrider Hotel in Honolulu on the evening of March 31. As Brinckmann could not attend, Daniel Janik, president of Savant Books and Publishers, the publisher of the book, received the award on his behalf. Hans Brinckmann's award-winning novel, In the Eyes of the Son, published by Savant Books and Publishers in August 2014, is now available as a Kindle eBook, at half the price of the printed version. 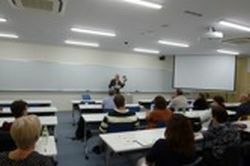 The 2015 Japan Writers' Conference was held on October 24 and 25 at Kobe Women's University, Suma Campus, not far from Kobe. Your Habri team gave presentations at the conference. 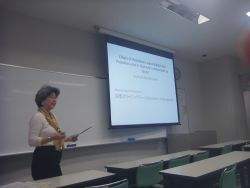 Hiromi Mizoguchi's topic was: "What's in a Name? The Importance of choosing the right Title for your Work." Hiromi shared her experience as the translator of Hans Brinckmann's works from English into Japanese. Literal translation of a title is less important than catching the spirit of the original, in addition to making sense and having it sound right. Is a title that's not translated into Japanese but rendered in the katakana version of the original acceptable? Should a title be short or long? What is a determining factor to make titles more 'marketable'? Sometimes adding a sub-title helps. She elaborated on these points with examples. Hans Brinckmann talked on: "Looking for the Maverick in the Crowd -and Writing about them." Hans' subject was his collection of over thirty essays he wrote of people he met in his life who left a vivid imprint on his memory. Some of these vignettes have been serialized, in Hiromi Mizoguchi's translation, in the literary magazine Atlas published in Tokyo. Four have been published so far. He intends to have the complete collection published in book form, in English. He explained that, rather than employing general principles of creating character, in writing his vignettes he focused on the personal qualities of the people that intrigued him. Several of the portraits are of well-known people - like Konosuke Matshita, Edwin Reischauer and Queen Beatrix - but fame was not a requirement for inclusion. Far from it: anyone who impressed him even during a single encounter or who lived a life that moved or fascinated him could qualify. Perhaps, he said "I was always instinctively looking for the maverick in the crowd." I’m happy to announce two new publications: a novel and an essay. My sixth book, In the Eyes of the Son, many years in the making, has just been released. It is a character-based novel, unusual in that it focuses on the realities of life in some of the countries I lived in between the 1950s and the early 1980s: post-war Holland, still-colonized Singapore, wind-swept Chicago, and New York with its racial tensions. The story is full of human drama, rich in dialogue, and with a healthy dash of humor and, well, "intimacy." The protagonist, Peter van Doorn, dreams of life with a camera. His left-wing father, a journalist and former WWII photographer – at first supports his son’s ambition and even gives him his wartime Leica. But when Peter tries to save someone from a fatal accident instead of "capturing the moment of violent death," Eduard decides that his son lacks the guts for "real" photography, the kind he practiced during the war, the only kind of photography "worthy of a man," even in peacetime. He forces Peter into overseas banking instead. Starting in 1953, Peter's exotic career takes him from his native Holland to Singapore, and on to Chicago where he marries a socialite. But his dream never dies, and at last, in 1978, he sacrifices his stable career and family to embark on the life of a freelance photographer – in New York. Two years later, with his savings running out, an unexpected breakthrough: an exhibition on the provocative theme "White poverty in black New York." But a vicious attack disrupts this first success, leaving him to wonder how he will ever reconcile with a stubborn father with whom he's never seen eye-to-eye. or the Press Release, click here: http://www.prlog.org/12354368 The book can be ordered from http://www.amazon.com/dp/0991562208 or http://www.amazon.co.uk/dp/0991562208 Both offer Look Inside features. Also available from Amazon Canada, Germany, France, Italy, Spain, and India. Also this month, a Japanese-language literary journal in Tokyo, Atlas, has included Hiromi Mizoguchi's translation of my seven-page essay, Tapestries for the Empress, as the lead piece of their No. 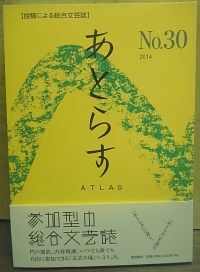 30 issue. It is the fascinating story of Stefan Lubienski, a Polish count I met in 1961 in the Netherlands when he was already in his seventies. He was the director of a high-class retirement home in Driebergen, not far from where my parents lived at the time, and my wife and I stayed at their B&B guesthouse, which was open to the public. When the count discovered that we lived in Japan, he invited us and told us his life story. He had studied music in Vienna, but was more interested in Eastern religions and philosophy, and wanted to go to Japan. Having no financial means, he moved to Paris to learn how to weave tapestries, as someone had told him he could make a living in Japan with that. Two years later he moved to Japan by ship, with his new-found wife, where he managed to eke out a living weaving tapestries, some of which were even bought by the Empress! There’s much more to his story, and before long I hope to publish the original in English. Saturday October 25 and Sunday 26, 2014. 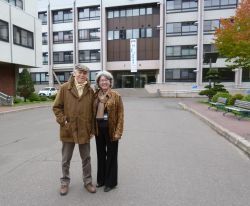 The conference, hosted by the Iwate National University in Morioka, Iwate Prefecture, was attended by writers, poets, editors and translators writing in English. It was a successful event, with twenty-five varied presentations triggering vibrant discussions. Hiromi Mizoguchi: "Literary Magazines in Japan - How to approach them to propose the publication of a translation of an unpublished essay in English." Hiromi explained how she succeeded in getting one Tokyo-based magazine, Atlas, to publish her translation of one of Hans's unpublished essays. N.B: In a subsequent meeting with Atlas' editor, he welcomed further submissions of Hans' works. Hans Brinckmann: "Long Gestation - Harmful or helpful to a Novel?" Lecture with readings from the novel In the Eyes of the Son, followed by Q&A. 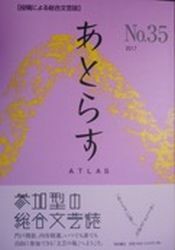 Hans related the history of his novel, which took him some seventeen years from conception in Australia in 1997, to rewriting in Japan, to publication by a U.S. publisher in July 2014, with many revisions and considerable pruning. His conclusion: the long gestation benefitted the final product, as witnessed by the highly favorable readers' reactions and reviews on amazon sites. See www.amazon.com or www.amazon.co.uk or www.amazon.co.jp and enter In the Eyes of the Son under "Books." Launching my latest book, "The Tomb in the Kyoto Hills." 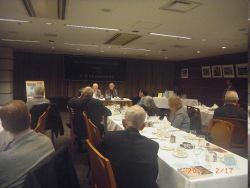 On Aporil 9, The Foreign Correspondents Club in Tokyo hosted a Book Break for my latest work of fiction, The Tomb in the Kyoto Hills and other stories, which came out last year. It was the third such occasion for me at the Club, following the introduction of my autobiography The Magatama Doodle in 2005 and a work of history, Showa Japan, the Post-War Golden Age and its Troubled Legacy in 2009. After a sit-down dinner, the charming chairperson for the evening, Ms. Suvendrini Kakuchi, introduced me to the twenty-five strong audience. 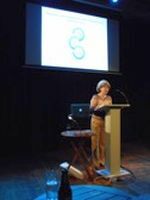 I gave a short lecture about my approach to writing why I don't stick to a particular genre, but indulge in producing fiction, non-fiction and poetry, in addition to keeping this website going and then read episodes from the book. The event concluded with a lively Q & A session. On September 25, at the invitation of the TAC Library Committee, I introduced my book of fiction The Tomb in the Kyoto Hills and other stories at the club. After an introduction about the background of the book and my diverse forms of writing (fiction, non-fiction, biography, poetry) I read selections from the book's title story. A lively Q & A followed. Though small, the audience showed keen interest in my life and writings. When I told them that I was writing down my wartime experiences in The Hague, there were shouts of "Make that your next book!!" "A look back at post-war Showa and what it means for the Heisei generation" at Cape Tower conference room, Minato- ku,Tokyo. 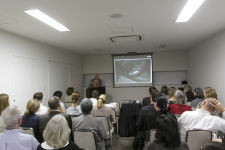 On September 28, at a bilingual seminar, organized by K.K. Informationer, and attended by about twenty young Japanese men and women. 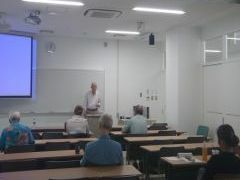 Hans Brinckmann gave a lecture in English, with Japanese translation by Hiromi Mizoguchi. The animated Q & A that followed revealed some of the issues related to the English language, living abroad, and career choices that members of the audience were struggling with. November 2 and 3, 2013. We attended the 7th Japan Writers Conference, this time held at a university in Nishihara, near Naha. Writers of every genre gathered there to introduce their writings, exchange experience, and provide guidance to students and aspiring authors attending the sessions. Some 35 writers of poetry, fiction and non-fiction, alone or in small groups, gave a total of 30 presentations in English over the two-day conference. Most of the presenters live in Japan, but some had flown in from abroad. Subjects ranged from "Writing the short personal essay" and "What Sherlock Holmes can teach writers" to challenging workshops on "Reeling and writhing: poetry editing" and "Writing from Discomfort." 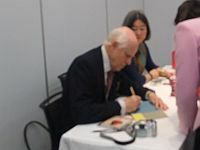 Habri team member Hiromi Mizoguchi talked on "The delights and pains of translating poetry English to Japanese," while Hans Brinckmann stressed the importance of choosing boldly between "First person or Third in writing fiction." After wrestling with such exciting topics and surviving the demanding Q & A sessions, we were all happy to relax in local pubs and tapas bars and really get to know each other. Hats off to John Gribble for organizing this successful and enjoyable conference. Date: Wednesday October 17th, 2012, at noon. Title: "Kizuna kara henkaku e: Bonds are Beautiful, but they won't Fix the Future"
1500 yen (drink included) as admission fee. Booking required. Hans Brinckmann has lived and worked in Japan, on and off, for over 30 years, since 1950, half that time as a banker, the other half as a writer. 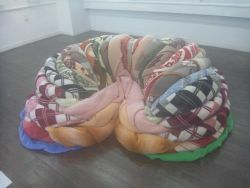 He calls himself a conscientious observer of Japanese society, both in its own right and in the international context. He is the author of several books, including two on Japan (see www.habri.jp). 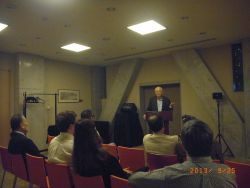 His thoughts on Japan after 3/11 are the subject of his talk, given as part of the Bookuoka book promotion series. He finds that kizuna was rightly chosen as the kanji of 2011, given the remarkable pulling-together of Japanese people from all areas and backgrounds to help alleviate the intense suffering in the afflicted region. But it seems politicians and bureaucrats have been relying too much on the people's self-help based on kizuna, and on the prevailing tendency not to question the actions of "those in charge" - a.k.a. political passivity. The revelations about the failure of the authorities and the nuclear power industry to prevent the 3/11 disaster, and their actions - or lack of them - since then, are finally waking up the voting public. The anti-nuclear marches this past summer are among the signs of change. Other developments include the emergence of new political activists, including one who says Japan needs a "dictator." What's really needed are concrete, well-articulated policies, and not only in rebuilding Tohoku and dealing with the nuclear energy issue, but also to secure Japan's stature in Asia and the world. Brinckmann will highlight some of the areas which in his opinion need urgent attention from both the authorities and the general public. Unless the voters get involved, Japan's democracy will continue to be the "work in progress" it has been since the end of the war. 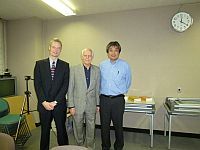 Presentation of my latest book of fiction, "The Tomb in the Kyoto Hills." Date: Sunday, November 18th, at 6:30 p.m.
Place: Good Day Books, 2-4-2 Nishi-Gotanda, Shinagawa-ku - 3 minutes' walk from Gotanda Station on the Yamanote Line. This presentation forms part of their BookNotes Speaker Series. A fifteen-minute interview with Hans Brinckmann and Hiromi Mizoguchi was aired on the cultural program "De Avonden" of the VPRO on Friday 24th February. It is mostly in Dutch, with some comments in English, and one of poem ("Animal Sorrow") read in both English and Japanese. 16 February 2012: Interview by Maarten Westerveen, for VPRO Cultural Program "De Avonden"
Westerveen: First of all, happy birthday! Brinckmann: Ah, yes - thank you! B: Indeed...and we met the present staff of the store, who showed some interest in the book, even though it's written in English and Japanese, not in Dutch, and they agreed to offer it for sale in their shop. A few days later we popped in again, and we had a good chat with the manager, who showed increasing interest in the idea of hosting a reading of poems from the book. We agreed in principle to organize such an event, and returned to Japan. The details were worked out by email. W: Could you perhaps read one of your poems, to help us understand why they invited you! B: Ah, yes, of course. Well, in that case... of course, the poems are all in English as you know... I'll read a poem entitled Animal Sorrow. W: Well, a little later I'd like to ask you why you've chosen to write your poetry in English... but first, as I mentioned already, I'm not here with you alone, but also with Ms. Hiromi Mizoguchi - I hope I pronounced that correctly - and you were so friendly to offer to read it in Japanese, so may I now ask you to do so! W: Thank you very much.... though I would want to know - the rhythm is completely different in Japanese, and I noticed that you, Mr. B, were reading along in the book while Hiromi was reading aloud, do you hear something very different when you listen to the Japanese translation? B: Yes, to some extent it is different, though the image of the original comes clearly across, for Hiromi's method of rendering my writings - including poetry, certainly poetry but also prose - is not to give a direct, literal translation of the words, but to recreate the mood. That's why I call her work not the translation of my writing, but her version. It's Hiromi's version of my poems. And that works well, I've noticed. W (switching back to Dutch): Do they place you in the Japanese tradition, or are you treated as a Western writer who happens to live and write in Japan? B: I think more the latter, because I myself do not write in Japanese. I do sometimes give a lecture in Japanese... and I believe, generally speaking, the nature of my writings is more non-Japanese than Japanese. That's not to say that it is English or Dutch in nature, but it is NOT Japanese. Perhaps it is more "cosmopolitan" because I've lived in several countries, and something always remains of the places you've lived for some time... Perhaps you should put that question to Hiromi. W: Uh, the question that Hans couldn't answer, or didn't feel comfortable answering, was how his writings seem - I'm specifically talking about his poems - do they seem to be standing in the Japanese tradition, or do they seem mainly a form of Western writing - a writer writing in a Western way? M: It's mixed. Very very...you can't categorize his writing. Not only his poetry, but his writing is a mixture of everything, and that also keeps me fascinated. W: Can you see actually the Japanese influence in his writing? M: In terms of - I don't know - writing style or...? W: That I leave up to you, you translated his work. But do you see Japan cropping up in his work? Like I can see this... he probably wouldn't have written that way or wouldn't have paid attention to it if he hadn't spent so much time here. M: ...is, his writing is very... as I said, although he has a sharp observing eye, his writing is sometimes very genteel and soft. So it痴 hardness and softness, and it's a mixture of galloping and just walking sedately... it's a very interesting, unique combination. And the rhythm he creates only by himself. B: Well, thank you. I didn't know! W: You hear that for the first time? W: Interesting...how the galloping, the hardness of the West alternates with the gentler, leisurely strolling of the Japanese. B: The way she expressed it just now I hadn't heard before. Yes, it's nice to hear that here in Amsterdam. W: Perhaps one has to be outside Japan to make a statement like that! B: Perhaps, yes. Kyo wa kou iu kotoba hajimete kiitemasu. Hatsumimi desu. B: Yes, I translated what I just said. W: On Sunday you're going to have your reading. W: What effect do you expect? What are you hoping to put across? Which aspects of your poems do you hope the audience will pick up? B: The aspects of my poems which are perhaps most important for me are how I observe other people as well as the unexpected twists in the mental processes and the actions of other people. I never cease being surprised by many aspects of life. Even small children on the street, how is it possible that a child of 4 or 5 behaves already like a young adult, almost independent, with opinions - that amazes me! And I like to express those thoughts in writing. In the end I think it is the awareness of the marvel of life, of living, that runs through my poetry, and that my poems derive their raison d'être mostly from that sense of wonder. Perhaps it sounds rather general, not very specific, but I can't express it better. Poetry, after all, is not a form of prose, not even a form of fiction. It is a separate form of writing, which I have described in my introduction as a kind of bridge between non-fiction and fiction. It manifests itself without you actually looking for it, like wildflowers along a path, under fences, while on the other side of the fence is the large field of monoculture, covered with wheat sown according to a fixed plan. That field, that's non-fiction, or perhaps fiction, but the poems - they are found under the fence, like little flowers here and there. Nobody planted them there, yet they raise their little heads. That surprises me, that intrigues me, and that's what I write about. B: Do itashimashite. My pleasure. The reading was substantially the same as the London reading of 14 February. A fifteen-minute interview with Hans Brinckmann and Hiromi Mizoguchi was aired on the cultural program "De Avonden" on Friday 24th February. It is mostly in Dutch, with some comments in English, and one of poem ("Animal Sorrow") read in both English and Japanese. Brinckmann read from his bilingual poetry collection The Undying Day, with translation of each poem by the translator, Hiromi Mizoguchi. 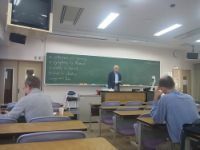 Date and time: October 21, 2011, from 10.30 to 12.00 a.m.
Place: University of Kochi, Eikokuji Campus, Kochi City, Shikoku. 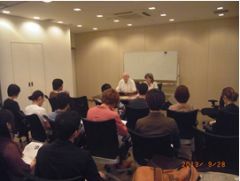 The 90-minute seminar was attended by about twenty students, both young and mature, and a few members of the faculty. After my introduction to familiarize the class with my background and approach to language and poetry, I read a selection of my poems from the recently-published The Undying Day, with each poem followed by Hiromi's Japanese version. During the lively discussion following the reading some of the students commented that hearing poems recited in this way was a far greater pleasure for them than merely reading poetry. Two women said they were "moved to tears" by a poem entitled Animal Sorrow. Another comment concerned the most whimsical of the poems, Making the Last Train. This was found to be "oddly fascinating" and "conveying a rather dark mood" despite its absurd and irrational theme. One of the older students wanted to know how one can "satisfactorily" translate poetry into another language, given the vast differences in culture, language structure, idiom and frame of reference. I replied that as attempts at straight translation seldom work for poetry, the best one can do is to try and evoke the images and thoughts conveyed in the original in the other language by finding acceptable similes. This is the method employed by Hiromi for my poetry, and the resulting texts are her "versions", rather than translations. 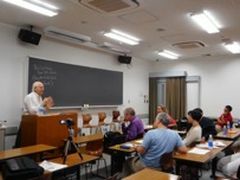 Professor Ioroi later expressed his satisfaction with the seminar, adding that his students were "far more active and outspoken during the discussion than was normally the case." "A look back at Post-War Showa, and what it means for the Heisei generation." Speaker: Hans Brinckmann, in English, with Japanese translation by Hiromi Mizoguchi. 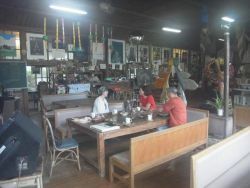 Date and time: October 21, 2011, from 6.30 to 8.00 p.m. I had been asked to speak on "what has changed in Japan" since my first arrival here in 1950, one of the themes of my book, Showa Japan: the post-war Golden Age and its troubled legacy (Tuttle, 2009). I met this request by comparing the "then" and the "now" citing many examples and personal experiences, and presented a brief slideshow of photos taken by me in Japan between the 1950s and 70s, to illustrate my comments. But given that the lecture was aimed primarily at Prof. Joos' undergraduate students, I used the occasion to stimulate them into a more proactive, internationalist way of thinking than was customary in the 1960s and 70s. In fact, the recent tendency of young Japanese to become increasingly inward-looking and to show little interest in overseas study or employment made this message all the more relevant. A spirited discussion followed. Below is a selection from the half dozen topics touched upon. An older, well-spoken lady asked whether the traditional Japanese virtue of "modesty" or "self-restraint" is disadvantageous in diplomacy and international business. In reply I suggested that while modesty may sometimes be appropriate in personal and social situations, in international relations it can be a serious handicap, and lead to being ignored. Even in domestic politics, "modesty" on the part of opposition parties could lead to a dictatorship of the strongest. The general public, too, should not hesitate to state their opinions if they have their own interests at heart. Someone then raised the issue of Japan's "war guilt." The arguments went back and forth, with one man suggesting that all Japanese must be taught their own wartime history, which is now often skipped in certain textbooks. My own view on the subject, which I made clear, is that it is enough - and necessary - to make children aware that the world's and Japan's history (including 20th century history) is full of wars and atrocities, but take care to avoid overexposing them to the subject to the neglect of more positive and edifying subjects. In other words: Instilling awareness without burdening them with a sense of personal guilt. There was even a question about the safety of Japan's large holdings of US Treasury bonds: "Will Japan get its money back?" I hedged my answer: there should be just as much legitimate concern about Japan's excessive national debt (at double its GDP the highest by far among advanced economies) as there is about America's fiscal health. Constraint on spending while finding new sources of revenue is needed on all fronts. Event: Hans Brinckmann read poems selected from his just-published bilingual collection of poetry, The Undying Day, together with Hiromi Mizoguchi, who read her Japanese translations of the poems. After the interval, Yoshiko Ieki, a noted harpsichordist gave a live recital featuring works by J.P.Sweelinck and J.S.Bach. Fiction writing is story-telling with a punch or caress. Non-fiction can be reportage or dissection, cool analysis or hot-blooded pamphleteering - any form of serious writing really as long as it is not fiction or poetry. Poetry is designed to seduce the ear. It may obey meter and rhyme - or take the form of blank verse. It doesn't have to make sense. It often springs up haphazardly, between the cracks of all that's orderly, like wildflowers along a path, under fences, in a field of planned monoculture. Poems bridge the chasms between emotion and reason. Their main task is not to conform or inform but to give voice to that which is hidden: to express life rather than describe it. I've just offered you my justification for the kind of poetry I write. It usually makes sense, I think, but sometimes it doesn't. Even to me. I'm going to read some poems from my collection The Undying Day, and Hiromi will read her translations - or, because poetry is notoriously difficult to translate, it is perhaps more accurate to call them her versions. We'll read three sets of three poems each, roughly arranged by theme, as in the book. The themes, which often mutually overlap, are Reflection, Whimsy, and Intimacy." Scenes at the June 5 reading. At right Brinckmann is reading one of his 'whimsical' poems. 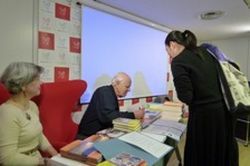 The event, attended by over 55 members and guests, was followed by a book signing. Hans Brinckmann's available books were all sold. The event was attended by about 35 members and guests. Topic: Japan during Post-War Showa and today. A comparison. The event was attended by about 20 members. 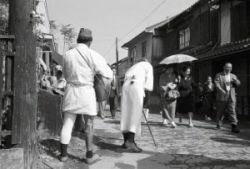 The exhibition of post-war Showa era photographs by Hans Brinckmann and Ysbrand Rogge at the Hyogo International Association in Kobe was successfully concluded at the end of November. 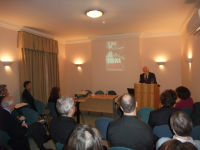 The Daiwa Anglo-Japanese Foundation in London hosted a book launch and lecture by Brinckmann on November 26, which was attended by over 60 members and guests. 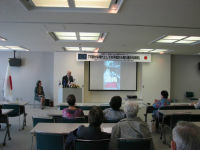 The talk was based on the book Showa Japan: the Post-War Golden Age and its Troubled Legacy and illustrated with a slide show. An animated Q&A session and reception followed the talk. 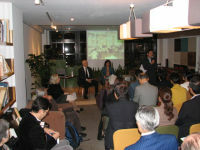 Brinckmann addressed an audience of around 50 at The English Club - a monthly activity of the English Speaking Union of Japan - on November 17at the Marunouchi Café in Marunouchi, Tokyo. The talk, with the title "The certainties of Showa as seen from uncertain Heisei", was given in the form of an interview by Hiromi Mizoguchi, the translator of Brinckmann's books and this website. The talk was illustrated with a slide show. The questions centered on the many uncertainties facing Japan in the present Heisei era (which began in 1989 when Emperor Akihito ascended the throne) compared with the life-time employment, firm social structures, continuous economic growth and other "certainties" of the (post-war) Showa era that preceded it. These subjects are also covered in some detail in Brinckmann's recent book, Showa Japan: the Post-War Golden Age and its Troubled Legacy (Tuttle 2008; Japanese translation published by Random House Kodansha October 2009). 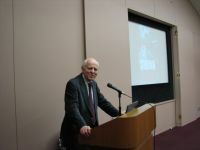 To coincide with the opening of the photo exhibition in Kobe, Brinckmann gave a talk, in Japanese, in the venue's lecture room, based on the Japanese edition of his book, Showa Japan. 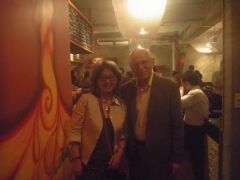 The talk was interspersed with excerpts from the book read out by its translator, Hiromi Mizoguchi. The audience showed much interest in the subject, and a lively discussion followed the one-hour presentation and slide show. The slides were taken during Brinckmann's decade-long residence in Kobe, starting in November 1950. 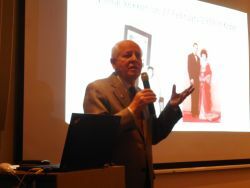 At a "Meet the Author" evening at the Tokyo American Club, Brinckmann introduced his book "Showa Japan" with a talk and slide show. The event was attended by about 40 TAC members and was well received, and almost every attendant purchased one or more of this books. Copyright © 2009-2017 Hans Brinckmann All Rights Reserved.